Another affordable rice cooker is the Rival RC101 5 cup rice cooker. And even though it only received 2 1/2 stars based on Amazon’s customer review, we figured it holds enough pros to squeeze in a “fair” rating for the price. This cooker is basic and easy to use, just measure, plug and press. The cooker is a 5 cup cooker which will prepare up to 15 cups cooked white rice. One thing we favored with the cooker is it comes with a steaming tray that allows for simultaneous steaming so folks can prepare two meal portions at once (tray not present in picture). This definitely helped with its rating! Issues With The Rival RC101? The cooker, like all rapid-style boil rice cookers acts/performs the same as like a stove pot so you may want to keep an eye on it since like a majority of these types of rice cookers tends to slightly crust the bottom layer of rice when near finished. While it does have a temperature sensor that kicks in once the water has boiled off, there still may be some mild scorching. Another small con folks report is spill-over issues due to excess pressure building up inside the cooker which makes the rice starch bubble up. To help avoid that, try cooking with vegetable stock or powered chicken stock instead of water, or use the steaming tray as your lid placing aluminum foil over the top. But other than that for the price the Rival RC101 is good for a quick and healthy meal, and comes with a non-stick bowl, measuring cup, glass lid for monitoring rice, steaming tray, and rice ladle for scratch-resistant serving. 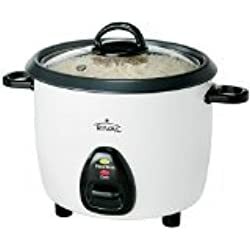 For the affordable price, basic design, and basic white color, this Rival rice steamer cooker is just as good as any other for around this range. Good for couples who eat rice once and a while, or as an inexpensive gift for someone who cooks rice on occasion as well. Nothing fancy, and for your more constant daily use we recommend researching others before making a final choice. We should also note that this cooker is best suited for cooking white rice and may come with some trail and error when preparing brown rice, jasmine, mixed, etc.